The condition in which blood clot forms in the deep veins of the body is referred to as Deep Vein Thrombosis (DVT). The main reasons which promote clot formation are stagnation of blood flow, damage to the vein vessel wall and in instances where the blood is thicker than normal with an increased tendency for clot formation. 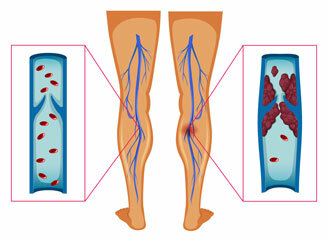 DVT occurs most often in the deep veins of the legs and thighs. What are the symptoms of DVT and how is it diagnosed? Physical examination of your legs for swelling, tenderness or skin discolouration. CT or MRI scan may provide clearer images of the deep veins when contemplating invasive treatment. The treatment options include conservative and invasive measures. Medications Your doctor will prescribe anti-coagulants (or blood thinners) that reduce the blood’s ability to clot. The role of these medications is to prevent the clot from extending and also reduces the risk of life threatening complication of pulmonary embolism where the clot travels to the lungs. The medication is initially administered as an injection which takes immediate effect and subsequently in the tablet form. Compression stockings are designed to help reduce the swelling in the legs following DVT and it also improves the drainage of blood from the legs. Thrombolysis is a treatment option that is available in cases where DVT affects the larger veins in the groin and lower abdomen (also known as ilio-femoral DVT). This treatment involves administering a thrombolytic agent which is a medication that breaks down clot. The medication is administered via a catheter which is a small plastic tube placed directly into the clot. However, it is also a procedure that has significant risks associated with its use particularly the risk of bleeding. Hence this treatment may not be suitable for all patients especially when the risk of bleeding due to other associated conditions makes them high risk. The risk of chronic venous insufficiency (discussed under Chronic Venous Ulcers) and other complications in later life are higher in patient with ilio-femoral DVT and thrombolysis treatment may help reduce the severity of these symptoms in later life. Untreated DVT can cause further extension of the clots along the deep veins and lead to pulmonary embolism (PE). PE is a serious condition in which the blood clot breaks up (known as embolus) from the deep veins and travels along with the blood flow and lodges in the lung, blocking the blood flow into the lung. Post- phlebitis syndrome (PPS) is a chronic complication of DVT and is characterised by swelling, skin discolouration, pain in the affected leg and recurrent sores (ulcers). In a hospital setting some of the steps taken to reduce the risk of DVT are compression stockings, regular injections or tablets to keep the blood thin, mechanical calf pumps to squeeze the blood from the legs and also early mobilisation after surgery.